Adobe seems to be now wholly embracing subscription based business model, and it firmly wants to implement the same across every verticals. In a latest development, it has been revealed that its much acclaimed as well as criticized Photography Bundle is now open to all for a monthly subscription charge of Rs 499/mo ($9.99/m globally) This is a limited time offer, and will expire on December 2, 2013. You can sign up for this program right here. What Will You Get For Rs 499/mo? In this special Photography Program, you can get access to Photoshop CC, Lightroom 5, subscription to Behance Pro-site and 20 GB of Cloud space along with access to training resources and all the latest updates and patches. Lightroom 5 is an easy tool, developed for photographers who want to digitally edit their photographs without being overwhelmed by the features of Photoshop. It has all the necessary tools which are required by a professional photographer. This is also available as standalone product. Behance is like a social networking site for creative people, where you can upload your latest designs and photographs and have a conversation around them. It can also be used as a portfolio by photographers and graphic designers. Subscription Based Model Is The Future? Adobe previously sold software in the traditional way: users bought licenses of its products such as Photoshop, Illustrator, After Effects etc and kept on using them until the license expired. 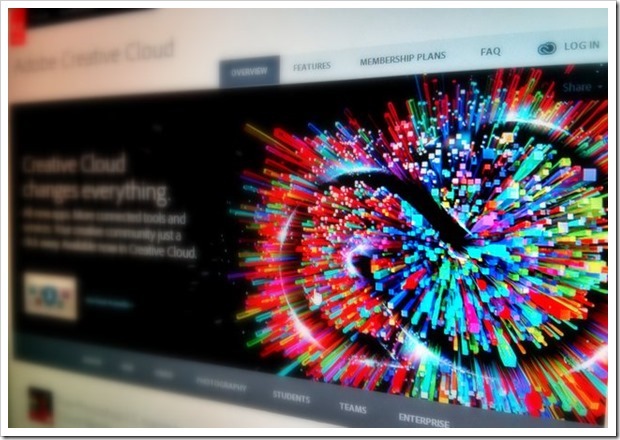 Back in May, 2012, it changed its business model, and introduced the Creative Cloud, which enabled users to subscribe to all these software for a monthly charge of $50 per month (Rs. 2700 in India). This included access to all their software plus various online services like Cloud storage and online training manuals. When this new subscription based model was introduced, there was hue and cry from every sector, as the existing users didn’t want to pay extra for the new subscription and wanted the old license method to be retained. There was even a Change.org petition filed against this step, with around 44,000 people supporting the cause. But Adobe proved its detractors and nay-sayers wrong. Subscription based model was a big hit, as its total customer base crossed 1 million, raising its stock prices and promising further growth. There were several inherent advantages in choosing this subscription based model, and Adobe was right in its calculations. To further promote the subscription based model, and to lure photographers into their network, Adobe introduced the Photography Program in September, 2013, wherein they offered Photoshop, Lightroom, Behance, 20 GB Cloud Space and Online training manuals for those, who had previously purchased Photoshop CS3 or higher version. And now, in the month of November, they have opened this offer for all, irrespective of whether you owned any previous version of Photoshop or not. Will you choose this new subscription based offer from Adobe or the old license based purchase was better? Do you believe that subscription model will survive the market? Please share your views right here!